Brimpton War Memorial – Dedication Service, 16 Jan 1921. The ceremony of unveiling the war memorial took place on Sunday. A series was first held in the church, at which a large congregation was present, including members of the Baptist Chapel. The service was conducted by the Rector of Brimpton (Rev T Patton), assisted by the Baptist student pastor, and the musical portion was performed by the united choirs, at the conclusion the "Dead March in Saul" was played, and a procession was then formed to the memorial, headed by the Rev H Badham, vicar of Wasing, who conducted the dedication choir, the churchwardens, and the Brimpton Girl Guides under the command of the Misses Haddan, and the remainder of the congregation. Three sides of a square were formed round the memorial, the ex-service men being drawn up on either side, prayers followed, and the hymns "Rock of Ages" and "O God our help" were heartily sung. Mr W A Mount, MP, then asked Admiral of the Fleet Sir Arthur Fanshawe, GCB, GCVO, to unveil the memorial.. Sir Arthur gave an eloquent address and reminded his hearers what a debt they owed to those who had fought and died for their country, not forgetting the nurses who had also played such a heroic part in the war. He then quoted St Peter's exhortation "Love the brotherhood, Fear God, Honour the King," and pointed out that it was the duty of everyone to do their utmost to foster goodwill and sympathy to all men. He then pulled the cord, releasing the Union Jack which of the National Anthem had been sung, the "Last Post" was sounded by two buglers of the Royal Berks Regiment, who had come from Reading especially for the occasion. The flag covering the memorial was the Admiral of the Fleet's flag, which was flown on the "Old Victory" on the occasion of the promotion of Sir Arthur Fanshawe to the rank of Admiral of the Fleet. 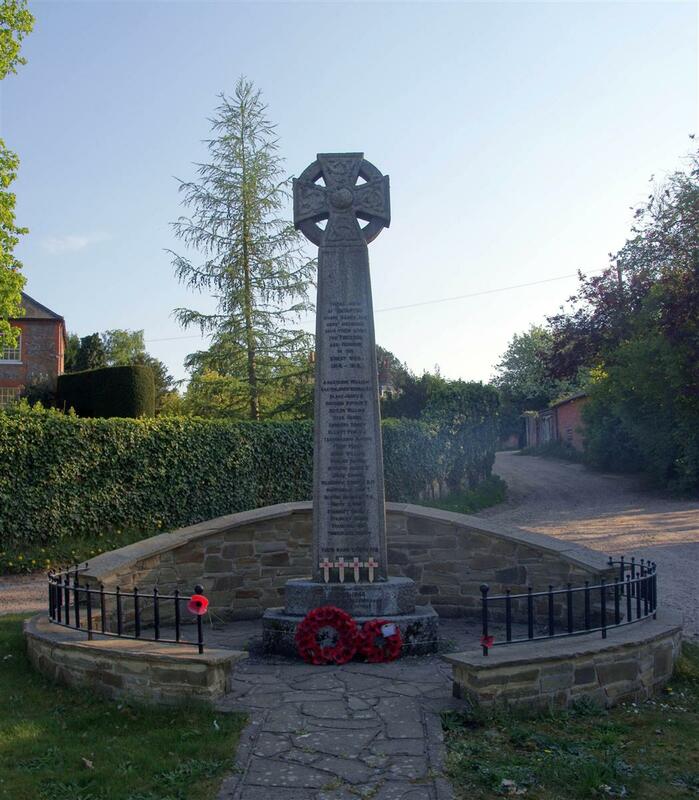 "These men of Brimpton, whose names are here inscribed, gave their lives for freedom and honour, in the Great War, 1914-1918." The ceremony was witnessed by a large number of spectators, including many relations and friends of the fallen, some of whom placed wreaths at the foot of the memorial. A half-muffled peal was rung before and after the service, and at 6.30 another united service was held in Brimpton Church which was well attended.